Back in the day, I was a die-hard anime fan. It was like a religious experience for me, wherein I devoted myself to catching up on new episodes and reading each installment of manga as soon as they were released. Anime pretty much consumed my life for a while. The holiest day for anime was Saturday, as I was able to watch brand new episodes on Cartoon Network’s adultswim. That is how I became acquainted with Ghost in the Shell, a brilliantly masterful show that revolves around Major Kusanagi, a female cyborg who leads a group of agents in a mind-21st century Japan as they try to stop various cyber-attacks and technologically advanced cyber organizations. Basically, Ghost in the Shell is like NCIS and Scorpion, but with a gritty—yet polished edge. Okay, it’s kind of hard to describe Ghost in the Shell, so I recommend watching either the show or the 1995 animated movie. After watching it, bathe in its magnificence. Though I wasn’t a die-hard fan of Ghost in the Shell, I still really enjoyed it. The writing was superb, the scenery and art style are spectacular, and the character development made me really respect each character in the series. I felt smart watching it. 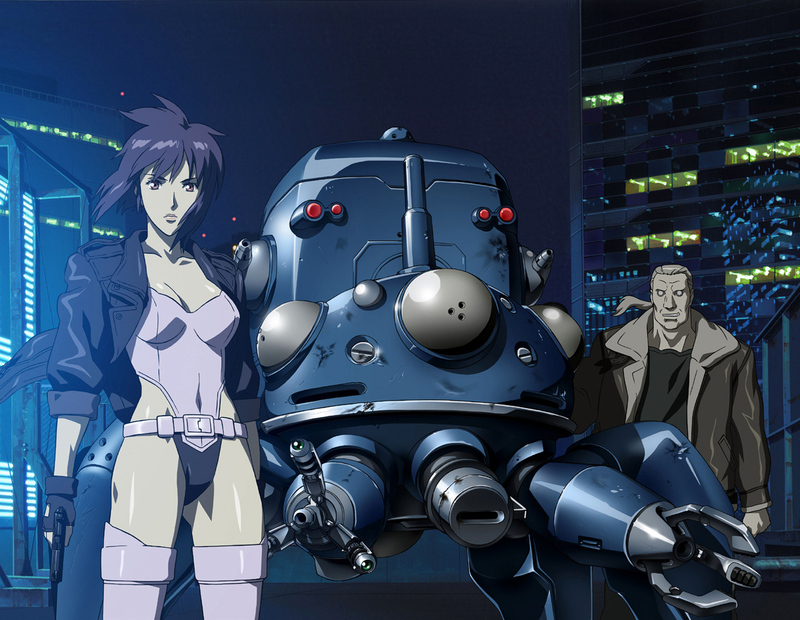 Just recently, I read Chris Plante’s article on TheVerge.com that there’s going to be a live-action movie made about Ghost in the Shell (link below to Plante’s article). My mind was boggled. Despite how amazing this news is, I had mixed reactions. On the one hand, I was excited, especially after hearing that Scarlett Johansson has signed on to play Major Kusanagi (see featured image). It seems like Johansson was born to play this role; they’re practically twins! Normally, it’s very difficult to find an actor or actress to play the role of someone animated, but I believe that Johansson as a choice is a step in the right direction. Love her or hate her, Johansson is notorious for playing very strong female characters, especially female leads. Her recent film Lucy was highly acclaimed, especially for her portrayal of the title character, and her performance as Black Widow in the Avengers and Captain America franchises has been looked upon as very positive in regards to a female superhero. So, in my opinion, she is more than capable of taking on the role of the Major in Ghost in the Shell. Another positive factor to consider is the production company that is taking on the film: DreamWorks. In recent years, DreamWorks has turned out some visually amazing films, like How to Train Your Dragon. Computer-generated graphics are kind of their thing, which will more than likely be the main component to bringing to life a futuristic Japan. Based on their talent for visual effects, I feel as though DreamWorks will be able to capture the sleek look of Ghost in the Shell. On the other hand, however, the track record for creating live-action renderings of famous animations is wibbly-wobbly. The live-action Death Note—another popular manga/anime series—which disappointed fans, and they cranked out two of those bad boys. (It’s like, do you not realize how awful this is?) But, the live-action Teenage Mutant Ninja Turtles film from 1990 has been regarded as a cult classic. So it’s a toss-up. Regardless, Hollywood has an affinity for transforming famous and beloved cartoons and anime series into live-action spectacles, but what they don’t realize is how loyal these fan bases are. Fans know discrepancies in characters and storylines, they know when an adaptation is true or untrue to the book. When Hollywood begins to meddle with the animated shows and movies that we have come to love—or grew up with—there are great grounds for fan uproar. Especially for anime, going into the realm of live-action is a scary task. The main film adaptations that come to mind for me are Avatar: The Last Airbender and Dragonball Evolution. If you haven’t heard about these particular films, it’s because people want to forget them, and they want everyone else to forget them. They were that bad. So there’s LOTS of pressure for any studio who is considering a live-action adaptation of a popular anime. As cool as Ghost in the Shell is, this particular story will not be an easy feat to adapt. There are some highly important components that DreamWorks and the director will have to absolutely put into the film, no questions asked. If you ever watched the series, or read the manga, you will know the Tachikoman; the Tachikoman were giant, free-thinking blue robots that assisted Kusanagi and her team. Despite their size, they were adorable, speaking in high-pitched, child-like voices—yet they were equipped with futuristic Gatling guns and could do some serious damage. 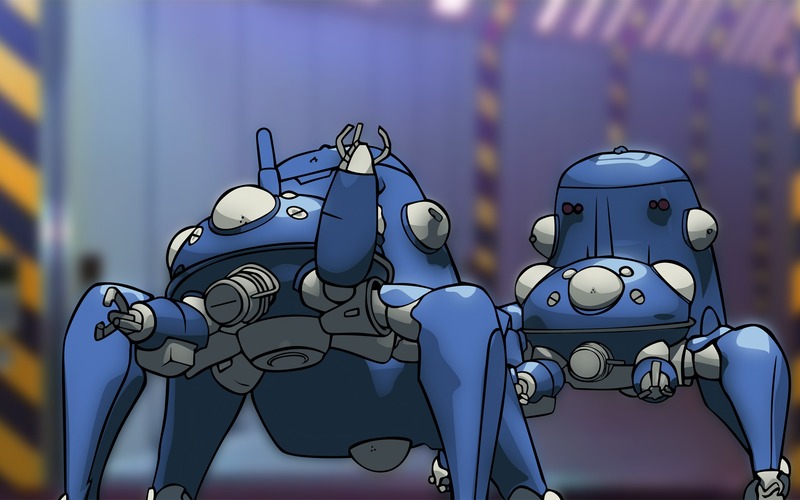 The Tachikomans were a vital part of Kusanagi’s team, but based on their size and their function, I have huge concerns for how they might be depicted. My other concern lies in the appearance of each character. Being set in a more futuristic time period, each character has a unique image. 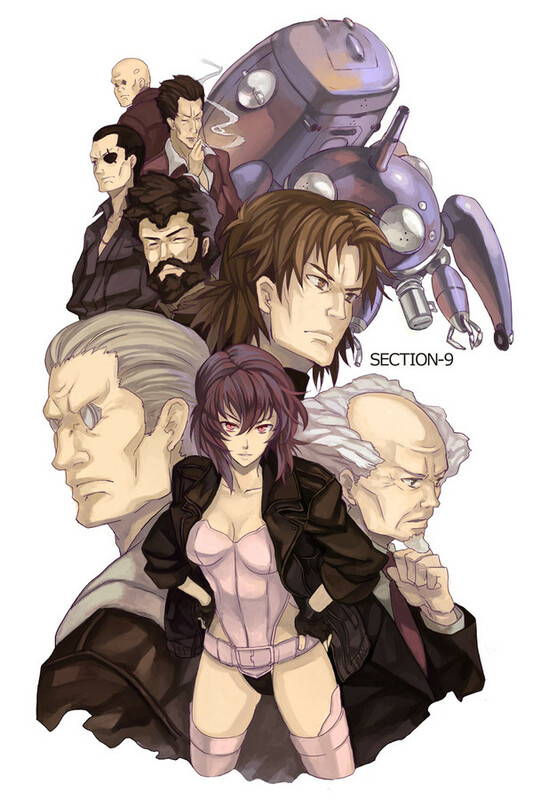 Major Kusanagi, for example, is dressed most of the time in a high-cut leotard with combat boots and a jacket. Oh yeah, and the purple hair. That too. But there are other characters that have distinct features which are highly unconventional. Take, for example, Botou: Yeah, he’s totally someone to bring home to Mom. Botou is my favorite character in the show, because he is a cyborg with a sense of humor. He’s the foil to Major Kusanagi, and balances her professionalism well. But he’s got, well, some pretty damn dead eyes. I mean, yeah, he’s a cyborg with prosthetic body parts, but those eyes, man. The eyes get you. 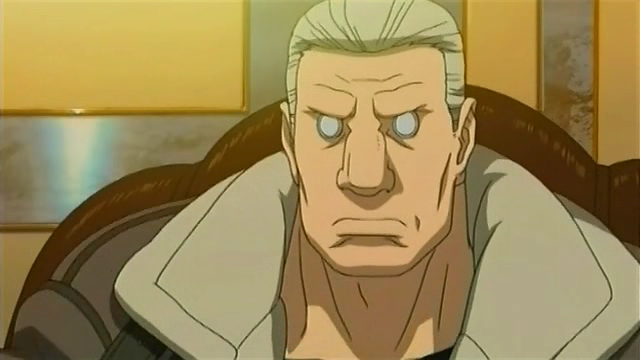 When I first heard about the production of a live-action film, the first thing I thought about was, “How are they going to recreate Botou’s soulless eyes?” I know make-up effects have drastically changed over the last decade, but the whole cast of a live-action Ghost in the Shell is going to have to do some major time in the chair to recreate these looks, because they’re all distinct. So, forget breathtaking visual effects and terrific script writing, I’m walking out of the theater if Botou doesn’t have a permanent blank stare. In the end, however, I’m super pumped about this. The foundation is solid already, as the original storyline is exceptional, and it’s an anime that has a cult following, but isn’t too popular, like Naruto or One Piece. Despite all the hiccups that could take place during the production of this live-action adaptation, I think that the producer—who happens to be Steven Spielberg—is making all the right decisions to recreate one of the best anime series of our time. I’ll admit, I’ve never heard of Ghost in the Shell but now you’ve got me really excited for this. Your enthusiasm really comes through in your writing 🙂 Also, I totally agree with you, this is a really risky business, making a live action movie from an anime. Avatar really was that awful. It’s like they tried to ruin it. But we’ll have to keep our fingers crossed that this crossover goes over a bit better. P.S. Don’t worry about the eyes – have you seen Storm from X-men? I love how incredibly passionate you are about this, and you really paint every picture in my head that I need. It’s crazy to think that in a world where so many people turn their heads to anime, you are there inspired and ready to analyze every aspect for those who may not run to the box-office and be determined to find the connection. I love going beyond the book series from the normative book-to-series and analyzing the style techniques and diffusion of the two. You go beyond that and bring in what you love and what you would rather see, and it’s amazing. Never have I met someone who is willing to tie in the connection between these anime with what bigger on screen directors are doing. If only I was a fly on the wall of your brain to really see what more you can dish out on the aspects of drawing in more of an audience base. Perhaps you love the exclusivity of it all and thrive from how different you are… keep it up Micky! Thanks Kelly! What a nice comment!